I went to watch the Arsenal U21s v West Ham at the Grove on Friday night and for only four quid, it proved to be the best value football entertainment that I've enjoyed so far this season. Admittedly the result might've been largely due to the fact that the majority of the Hammers regular U21 side were not involved, seemingly with most of them on the bench in the first team squad for their historic first triumph at Anfield in half a century. Nevertheless the incisive Young Guns were 2-0 up inside of the first fifteen minutes and it was extremely refreshing to see them produce at least two inventive corner routines in the opening forty-five. This was evidence of their productive use of their time spent on the training ground and it left me wondering why on earth our first XI can't do likewise? In the end, it finished up as a 5-0 tonking for the Irons, with Jeff Reine-Adelaide catching the eye with his silky skills, but with the goals shared out amongst four different scorers, it was a good team performance all round. 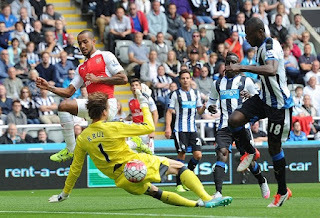 Obviously I wasn't expecting quite such an easy ride at St James Park the following day but I couldn't have possibly guessed that we'd be going into the Interlull with the Gunners leading goalscorer being the less than prolific OG! Having notched more than the combined efforts of Giroud and Walcott, surely AW should pull his finger out and offer this geezer a contract? I shouldn't really be moaning with the Gunners faring far better than the likes of Chelsea and Liverpool. Yet watching us dominate 74% of the possession against the ten man Toon, I couldn't help but think that genuine title contenders such as Man City wouldn't have been content to sit on a slender, single goal lead and leave themselves at risk of blowing the three points in the event of the home side nicking a draw with a surprise breakaway at the death. Aguerro, Silva and co. would've been far more clinical and made their superiority tell, with a far more emphatic margin of victory. Nevertheless things could be a whole lot worse and we could've spent the best part of £250mill and still be even more desperate for a striker, as is the case with LVG at Man U. However I can't help but fret that even if AW has got hopes of landing anyone before the transfer window shuts, presumably he's waiting until either the selling club is forced to accept a lesser sum at the last moment, or we're at the end of a transfer chain that's waiting for the hectic last gasp merry-go-round to begin to move. Either way, we're likely to be at risk of being gazumped by far more desperate managers who are willing to flex their financial muscle and flash the cash necessary to stick a spoke in Wenger's wheel? There was much delight amongst the travelling Gooner faithful at being geographically blessed by the dream ticket promotion of Watford, Bournemouth and Norwich. Nevertheless, having previously only dipped our toes in the water, in journeying across the Thames to Selhurst Park, it’s not until after having endured a seriously arduous awayday outing that one feels truly immersed into this season’s campaign. As ever, the long schlep back to London from Toon Town seemed suitably truncated, not only due to having all three points safely ensconced in our back pockets, but with the time passing so much more pleasantly, as we savoured the titillating Schadenfreude of the radio commentary from Stamford Bridge, with the Gobby One’s anniversary celebrations going so awry. Despite St. James Park being such a happy hunting ground, with the Gunners having not tasted defeat on the Toon’s home turf during the past decade, there was a prevailing mood of trepidation as we made our assault on the oxygen-starved altitude of Level 7 of the Leazes Stand at lunchtime on Saturday. As scoreless draws go, last Monday night’s encounter with the Scousers might’ve made for highly entertaining fare, but there was no hiding from the fact that we continue to lack the crucial cutting edge necessary to break our home goal-scoring duck. While the implication to be drawn from the Toon’s creditable 0-0 draw at Old Trafford is that the Wally has been bashing heads with his Brolly. McClaren somehow appears to have introduced more steel into the Geordies’ previously porous defence. The early KO in the North-East served as merely the first of this season’s succession of customary reaffirmations of the obvious contempt of those responsible for dictating the live TV schedules, in taking it for granted that the travelling faithful can be relied upon to religiously turn up and play our part, in providing the necessary televisual spectacle, no matter how impractical this might be. Like most other Gooners, I let out an exasperated groan at being lumbered in Bayern’s group (yet again!) in Thursday’s Champions League draw, knowing that the likely limit of our ambitions will be another knockout stage exit, after qualifying in 2nd place behind Munich’s master-race. Frankly, if we can’t overcome Olympiakos and Zagreb, we don’t deserve to be there but I’m sure I wasn’t alone in having to seek enlightenment from Google to find a more familiar moniker for GNK Dinamo. I had the needle to Chelsea, as unlike Blues fans, I quite fancied a trip to Tel Aviv. Still, at least our perennial invite onto the world’s most glamorous sporting stage invariably proves educational. I was clueless as to the location of the Croatian capital before the draw. In the days since, I’ve been struggling to find a means of accompanying the Gunners to Zagreb in a couple of week’s time, without totally breaking the bank. 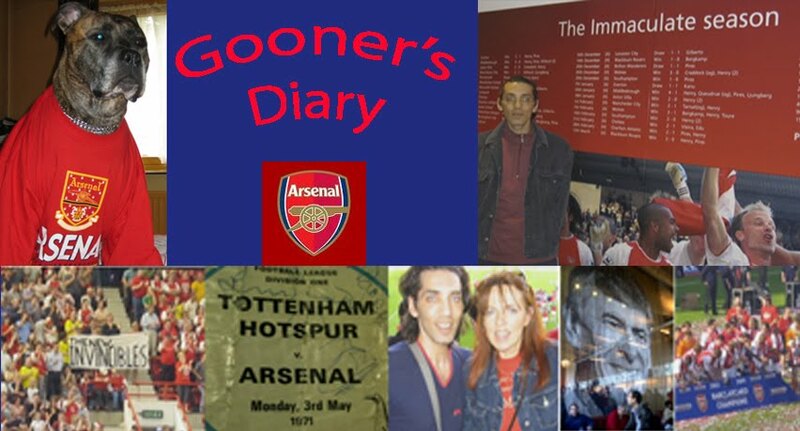 Sadly, I might be “past it” but for plenty of Gooners, Saturday’s untimely kick-off proffered an excuse to travel up the day prior. As evidenced by those arriving at the ground with obvious hangovers, after having taken out an insurance policy on a bad result by ensuring they’d been suitably hammered the night before. At the very least, they’d be returning home with happy memories of Newcastle’s “banging” nightlife. Doubtless the Geordies will contend that it was Andre Marriner who definitely got out of his bed on Wearside and that it was the card happy ref who was most in need of some Alka Seltzer. Yet with his aid, these Gooners were grateful to have enjoyed both their piss-up and the three points. Considering the way in which renowned Gooner Mo Farah was simultaneously making history in Beijing, completing his stupendous “triple double”, the Gunners could well do with some lessons in clinical finishing from Mo. 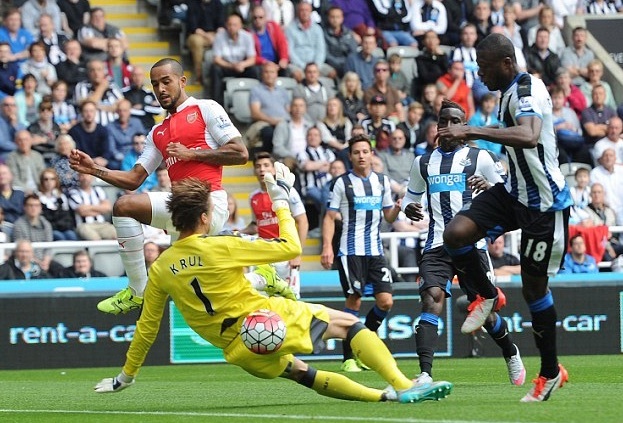 In their efforts to knobble Alexis and le Coq, the Toon shot themselves in the foot with their “over enthusiasm”. Yet as is so often the case, not only did the ref put the kibosh on a potentially entertaining encounter, it really didn’t do us any favours. Mitrovic’s early bath left the Gunners looking as if they’d already won the game and without Coloccini’s inadvertent contribution, we might’ve found ourselves ruing our failure to press home our advantage. The early start also meant that we made it home in time for Match of the Day. Where one couldn’t avoid the contrast between Walcott’s profligacy in front of goal and Sterling’s instinctively clinical strike for City. Not to mention Arsène’s blinkered obliviousness to the opposition, preventing us from ever profiting from the sort of tactical half-time tinkering seen from Pellegrini. With most of the competition splashing the cash, like it’s going out of fashion, I refuse to believe that we lack sufficient financial muscle to secure any of those players who are incessantly being touted in the media. Seemingly it’s le Prof’s parsimony that always leaves us waiting for the vagaries of the transfer merry-go-round to fortuitously deposit a star-name at our door, instead of simply stumping up whatever it takes to land our targets. Surely this is a false economy, if it leaves our squad with patent deficiencies and denies them the psychological boost needed to mount a serious challenge for glory. The old adage says that you can’t buy character. Even in the unlikely event that Arsène silences all his critics and leaves everyone agog, by pulling off a transfer coup (or two!) before deadline day, there’s no guarantee this will have the desired effect. Yet without more firepower, or a viable alternative for Coquelin, our squad will be no better equipped to believe themselves capable of beating the likes of Bayern and it’s hard to envisage anything other than the same “nearly men” script that’s sadly become the Arsenal’s infuriating trademark.